51 Hereford is located on the west side of Hereford, between Commonwealth and Newbury, with 49 Hereford to the north and 53 Hereford the south. 51 Hereford was designed by Bradlee and Winslow, architects, and built in 1882 by Vinal and Dodge, masons. It is one of five contiguous houses (45-47-49-51-53 Hereford) they built for speculative sale in association with building contractor George Wheatland, Jr. He is shown as the owner on the original building application for all five houses, dated February 24, 1882. 47-53 Hereford are designed as a symmetrical composition, somewhat unbalanced by 45 Hereford. The block of Newbury between Hereford and West Chester Park (Massachusetts Avenue) was intended primarily for stables, including private carriage houses and larger public livery stables, and in 1882, when 45-53 Hereford were built, there already were several stables directly across the street, on the south side of Newbury. 53 Hereford was designed with a window-less wall on Newbury, probably to avoid looking onto these stables and to firmly orient 45-53 Hereford in an eastward facing direction, as a residential block of buildings. The land for 45-53 Hereford was acquired on April 9, 1881, by George Wheatland, Sr., of Salem, from Caleb H. Warner and Charles F. Smith, trustees for the benefit of the creditors of Nathan Matthews. It originally had been purchased by Nathan Matthews on January 2, 1871, from the David Sears family, which held large holdings of Back Bay tidal lands. The deed to George Wheatland, Sr., included a restriction that only dwelling houses facing Hereford could be built on the land. The restriction was for the benefit of the owners of the land at 314-320 Commonwealth, which Caleb Warner and Charles Smith had sold in April of 1879 to Sumner R. Mead and to Frank N. Thayer and William H. Lincoln. On February 18, 1882, George Wheatland, Sr., sold the land to Warren D. Vinal and Charles A. Dodge, the builders. On the same day, they subdivided the land into five lots and entered into a mortgage with George Wheatland, Jr., on each lot, probably to provide the funds for the construction. In November of 1882, after the houses were completed, Vinal and Dodge sold 45 Hereford and 53 Hereford to individual buyers, and in February of 1883, they sold 47-49-51 Hereford to real estate dealer Brice S. Evans. He sold 51 Hereford in August of 1883, but 47 and 49 Hereford remained unsold, and on April 4, 1884, George Wheatland, Jr., foreclosed on his mortgages to Vinal and Dodge, which had been assumed by Brice Evans, and took possession of the two houses. He sold them later in 1884. 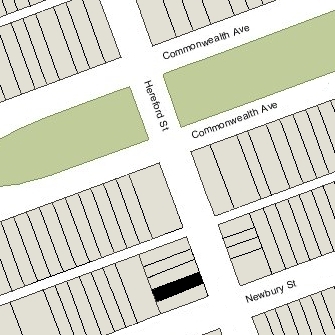 The original lots at 45-53 Hereford were 67 feet deep (east-west) and had a four foot easement at the rear to provide passage and drainage from all five houses to the alley between Commonwealth and Newbury. To the west, behind the five houses, was a lot with a 23 foot 3 inch frontage on Newbury. On April 19, 1886, the individual owners of the houses purchased the portions of this lot behind each of their houses, extending the size of their lots to 90 feet 3 inches. Although the reason for this purchase is not known, it is likely that it was to preclude construction of a stable on this land and to provide a larger buffer between the houses and the stable district. On March 8, 1888, the owners of the five houses agreed to move the easement for passage and drainage to the new western edge of their property and share the cost of a new sewer system at that location. That new drainage was not built, however, and on April 8, 1908, the owners agreed that the 1888 agreement remained in effect and that, until a new sewer was built, continuing to use the old sewer, located about 65 feet west of Hereford, would not constitute an easement over the properties. Click here for an index to the deeds for 51 Hereford. On August 11, 1883, 51 Hereford was purchased from Brice S. Evans by commission merchant George H. Tilton. He and his wife, Elizabeth Winslow (Porter) Tilton, made it their home. They previously had lived at 17 Beacon. They also maintained a home in Wenham. Elizabeth Tilton died in January of 1896. George Tilton continued to live at 51 Hereford until his death in November of 1905. On May 15, 1906, 51 Hereford was purchased from George Tilton’s estate by Dr. Robert Soutter, a physician and orthopedic surgeon. He and his wife, Helen Elizabeth (Whiteside) Soutter, made it their home. They had been married in August of 1905 and had lived at The Beresford at 845 Boylston during the 1905-1906 winter season. Prior to their marriage, he had lived at 30 Marlborough. They continued to live at 51 Hereford in 1909. 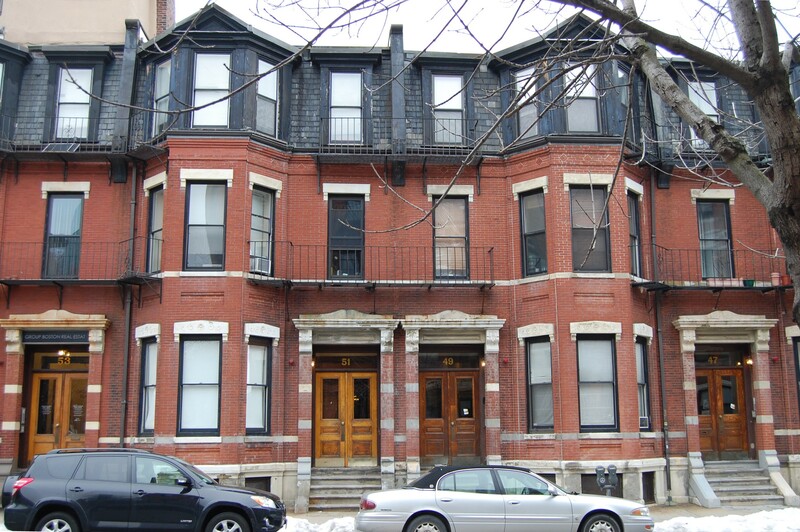 Living with them were at least two boarders: Dr. Robert Henry Vose, a physician, who had lived and maintained his office at 347 Marlborough in 1908, and James Donald Cameron Bradley, a broker, who had lived at 192 Beacon in 1908. In April of 1909, the Soutters purchased and subsequently moved to 53 Hereford. Dr. Vose and J. D. Cameron Bradley moved with them. The Soutters continued to own 51 Hereford, leasing it to others. On October 6, 1913, Robert Soutter transferred 51 Hereford and 53 Hereford into Helen Soutter’s name. By the 1909-1910 winter season, 51 Hereford was the home of Dr. Channing Frothingham, Jr., and his wife, Clara Morgan (Rotch) Frothingham. In February of 1909, when their daughter, Mary, was born, they had lived at The Beresford at 845 Boylston. Channing Frothingham was a physician; Clara Morgan (Rotch) Frothingham was an artist. Living with them were Dr. Francis Lowell Burnett, a physician, and Dr. William Edwards Ladd, a pediatric surgeon. They both also maintained their medical offices at 51 Hereford. Dr. Ladd married in August of 1910 to Helen Katharine Barton and they moved to 42 Gloucester, where he also moved his medical office. Dr. Burnett moved his home and office to 82 Beacon in 1912. He married in March of 1913 to Helen Read. The Frothinghams continued to live at 51 Hereford in 1914, but had purchased and moved to 395 Marlborough by 1915. 51 Hereford was not listed in the 1915-1917 Blue Books. 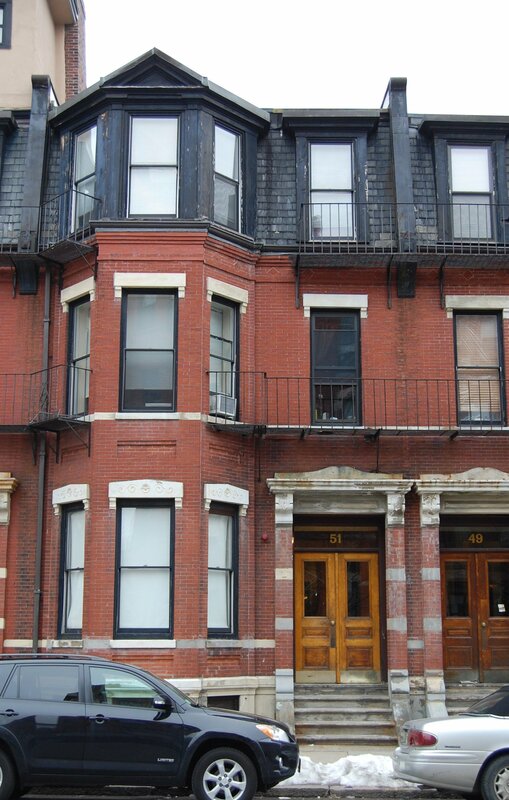 By the 1917-1918 winter season, it was the home of stockbroker Alfred Codman and his wife, Lydia (Eliot) Codman. They previously had lived at 21 Lime from about 1914, and had lived at 211 Beacon in 1911. They also maintained a home in West Roxbury. Alfred Codman’s business failed in the summer of 1917, and Mrs. Codman undertook a millinery and lingerie establishment at 51 Hereford. She employed several women to work for her, and as a result Mrs. Soutter was cited by the Building Department for failing to have sufficient egress. The Codmans continued to live at 51 Hereford during the 1918-1919 winter season, but moved thereafter to 3 Arlington. In the early and mid-1920s, 51 Hereford was operated as a lodging house, with several residents listed in the City Directories and Lists of Residents. By the 1925-1926 winter season, 51 Hereford was the home of Dr. Henry Jackson, a physician. He was a widower, his wife, Lucy W. (Rice) Jackson, having died in 1924. Prior to her death, they had lived at 380 Marlborough. He also maintained a residence in North Haven, Maine. Dr. Jackson continued to live at 51 Hereford until about 1933. The house was not listed in the 1933-1936 Blue Books and was shown as vacant in the 1934 and 1935 City Directories. In 1935, 51 Hereford was the home of Culver Louis Tice, a real estate agent, and his wife, Catherine (Power) Tice, who operated it as a lodging house. They previously had lived at 81 Westland. Their daughter, Dorrien June (Tice) Knott, the former wife of Kenneth Woodhouse Knott, lived with them. She previously had lived in Arlington. In January of 1936, the Building Department wrote Helen Soutter indicating that it had been informed by the Licensing Board of an application to operate a lodging house at 51 Hereford, and advising her of the requirements to permit its use for that purpose. Soon thereafter, the Tices and Dorrien Knott moved briefly to 293 Newbury. By 1938, Dorrien Knott lived at 48 Hereford, and in October of 1938, Culver and Catherine Tice purchased 53 Hereford. On November 9, 1936, 51 Hereford was purchased from Helen Soutter by Phoebe C. Ferreira, the widow of John F. Ferreira, who operated it as a lodging house. 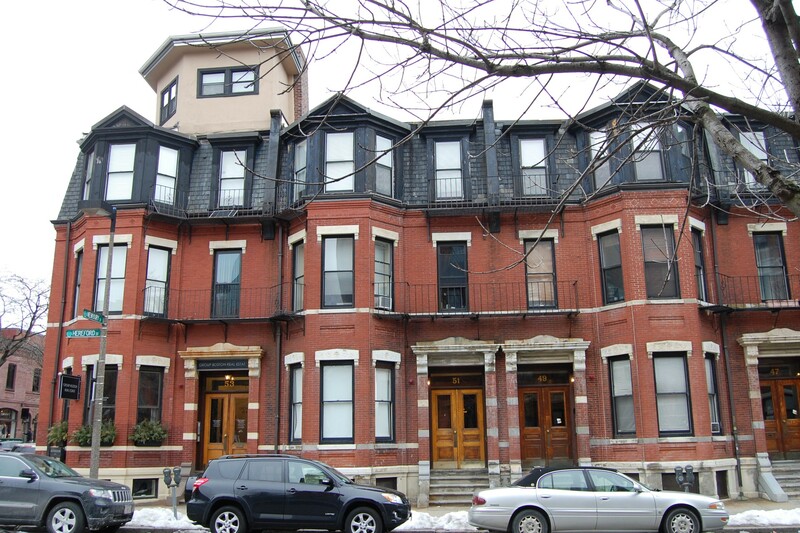 She previously had lived at 280 Newbury. In January of 1940, the Building Department wrote her to indicate that the property was being used as a lodging house without a license and required additional means of egress from the second and third floors. She continued to live (and probably operate a lodging house) at 51 Hereford until about 1945. On July 17, 1945, 51 Hereford was acquired from Phoebe Ferreira by Frederick E. Ordway, an elevator operator in the Pemberton Building and a real estate conveyancer. 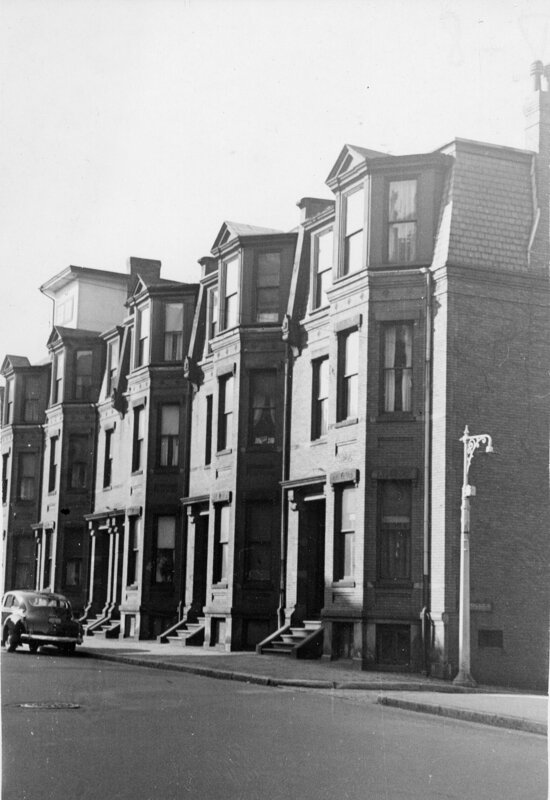 On October 4, 1945, Joseph P. Brennan, a realtor who lived in an apartment at 299 Marlborough, applied for permission to convert the property from a single-family dwelling into a lodging house. He subsequently abandoned the application. The house was shown as vacant in the 1946 City Directory. On March 14, 1946, 51 Hereford was acquired from Frederick E. Ordway by attorney Elmer Payson Atherton. He and his wife, Marian Frances (Connor) Atherton, lived in Wellesley. On April 3, 1946, 51 Hereford was purchased from Elmer Atherton by George Whiting Roberts and his wife, Jean (Abrams) Roberts. George Roberts was a former member of the Boston City Council and the Massachusetts House of Representatives. In 1940, he had run for Attorney General. In December of 1948, he was appointed an associate justice of the Boston Municipal Court. George and Jean Roberts continued to live at 51 Hereford in 1950. On June 30, 1950, 51 Hereford was purchased from George Roberts by Kingsley White Bullock, a restaurant manager. It became his home and the home of his mother, Helen (White) Bullock, the widow of Charles L. Bullock. They previously had lived in an apartment at 421 Marlborough. Helen Bullock operated 51 Hereford as a lodging house. Helen Bullock continued to live there and operate a lodging house until about 1961. On October 17, 1961, 51 Hereford was purchased from Kingsley Bullock by John J. Henderson and his wife, Mary E. Henderson. They previously had lived at 513 Beacon, where they operated a lodging house. 51 Hereford changed hands and on February 21, 1966, was acquired by Dr. Rose (Wexler) Winston, a physician. She already owned 53 Hereford, and in August of 1967 she acquired 47–49 Hereford. She and her husband, Dr. Murray R. Winston, also a physician, lived at 133 Commonwealth. She operated 47-49-51-53 Hereford as lodging houses. In May of 1976, she applied for (and subsequently received) permission to legalize the occupancy of 51 Hereford as a lodging house. On July 29, 1992, real estate broker and investor Patrick Joseph Glynn purchased 47-49-51-53 Hereford from Stephen W. Howe, guardian of the estate of Rose Winston. In August of 1992. Patrick Glynn applied for (and subsequently received) permission to convert 51 Hereford from a lodging house into seven apartments. After receiving the approval, the Rent Equity Board ruled that the property could not be converted from a lodging house, and in December of 1993, he applied for (and subsequently received) permission to convert it back into a lodging house and one apartment. On December 22, 1994, 51 Hereford was acquired by the 51 Hereford Street Limited Partnership, the general partner of which was Countryside Management, Inc. (Patrick J. Glynn, treasurer, and his wife, Anne T. Glynn, president). On the same day, 47 and 49 Hereford also were acquired by parallel limited partnerships, and in August of 1995, 53 Hereford was acquired by another limited partnership of which Countryside Management was the general partner. In February of 1999, 45 Hereford was acquired by the 45 Hereford Street LLC (Neil G. Glynn, manager). 51 Hereford remained a lodging house in 2015.